LOS ANGELES (March 23, 2018) — A new study has revealed that the human brain's tiniest blood vessels can activate genes known to trigger spinal motor neurons, prompting the neurons to grow during early development. The findings could provide insights into how amyotrophic lateral sclerosis (ALS) and other neurodegenerative disorders may develop. To make the discovery, investigators successfully re-created living tissues of the blood vessels and the spinal motor neurons–which control muscles–outside the body to show how they interact. "Until now, people thought these blood vessels just delivered nutrients and oxygen, removed waste and adjusted blood flow. We showed that beyond plumbing, they are genetically communicating with the neurons," said Samuel Sances, PhD, a postdoctoral fellow at the Cedars-Sinai Board of Governors Regenerative Medicine Institute. He is the first author of the study, published in the journal Stem Cell Reports. When a human embryo is about four weeks old, Sances explained, new blood vessels begin to surround a primitive column of cells that eventually will become the spinal cord. Driven by developmental genes, some of these cells turn into spinal motor neurons. The study showed the cells of the brain's smallest blood vessels, known as capillaries, are capable of activating these genes, which can spur spinal motor neurons to grow and mature. Besides providing insights into human biology, the study opened a new pathway to unraveling the mysteries of disorders such as ALS, or Lou Gehrig's disease, Sances said. ALS is a progressive, fatal disorder that kills motor neurons. There is no known cure. More than 6,000 people in the U.S. are diagnosed with the disorder each year, according to the ALS Association. "What may go wrong in the spinal neurons that causes the motor neurons to die?" Sances asked. "If we can model an individual ALS patient's tissues, we may be able to answer that question and one day rescue ALS patients' neurons through new therapies." The study's findings were made possible by a unique pairing of stem cell science with Organs-on-Chips technology, which re-creates human biology in micro-engineered environments. Cedars-Sinai investigators first took samples of skin cells from adults and genetically reprogramed them into induced pluripotent stem cells, which can create any type of cell–in this case, spinal motor neurons and the lining of the brain's capillaries. The team placed these cells in the tiny channels of Organ-Chips, which are made of flexible polymer and are about the size of AA batteries. In the chips, nurtured by special fluids, the cells of the two different tissues thrived and interacted with each other. "This study told us something important about how our neurons develop," said Clive Svendsen, PhD, professor of Medicine and Biomedical Sciences, director of the Cedars-Sinai Board of Governors Regenerative Medicine Institute and senior author of the study. As a next step, he added, investigators are developing plans to use chip technology to compare the vessel-neuron interactions in ALS patients against those of individuals without ALS. The research is part of the new Patient-on-a-Chip program, a collaboration between Cedars-Sinai and Emulate Inc. in Boston to help predict which disease treatments would be most effective based on a patient's genetic makeup and disease variant. Emulate produces the Organ-Chips used in the program. Geraldine A. Hamilton, PhD, Emulate's president and chief scientific officer, is a co-author of the spinal motor neuron study. In February, investigators from the two organizations announced they had used an Intestine-Chip to model a human intestinal lining. The Patient-on-a-Chip program is an important initiative of Cedars-Sinai Precision Health, whose goal is to drive the development of the newest technology and best research, coupled with the finest clinical practice, to rapidly enable a new era of personalized health. Disclosure: Cedars-Sinai owns a minority stock interest in Emulate Inc. An officer of Cedars-Sinai also serves on Emulate's board of directors. Emulate provides no financial support for this research. Funding: Research reported in this news release was supported by the National Institutes of Health Tissue Consortium 2.0 under award number 1UG3NS105703- 01, the ALS Association and the California Institute for Regenerative Medicine. 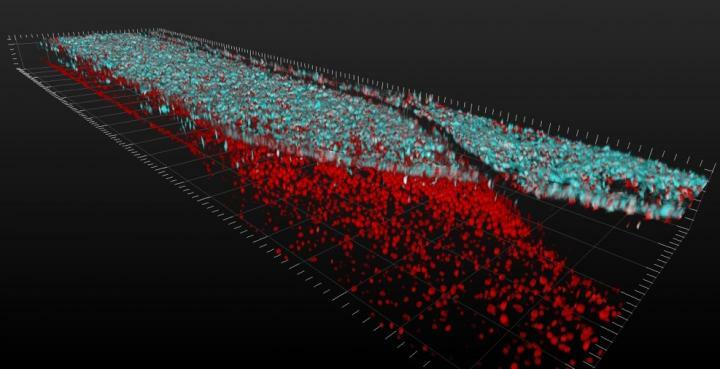 3D video shows layers of spinal motor neuron cells (top, in blue) and capillary cells (bottom, in red) inside an Organ-Chip. Top-down view shows interconnected network of spinal motor neurons (blue) that interacts with the capillary cells below (in red). The video was produced using a confocal microscope; colors were generated by staining with fluorescent antibodies. Hundreds of spinal motor neurons spontaneously communicate through electrical signals inside an Organ-Chip. Neurons fire individually (flashing dots) and in synchronized bursts (bright waves). The activity was observed using a dye that fluoresces when neurons send an electrical signal.